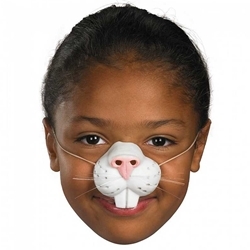 This bunny animal nose mask has a number of different uses including the Easter Bunny, the White Rabbit or March Hare from Alice in Wonderland, or as a rabbit for Halloween when paired up with a simple white outfit. Don't forget a pair of bunny ears to complete the look! The Bunny Nose is colored as pictured with attached whiskers and a beige color elastic band for comfortable one size fits most sizing. Pictured on a child but can be worn by adults as well!